When I picked up my phone from the charging station in the living room this morning, it greeted me with, “you won big price here…” My friend Feng had texted me on WhatsApp. The International Violin Competition of Indianapolis had run a rigorous, systematic testing process in order to source a couple of excellent violins for their laureates. It took place simultaneously with their violin competition, and they called it the 21st-century violin search. And yesterday, minutes before announcing this year’s laureates, Mr. Glen Kwok, executive director of the competition, announced that they had chosen the violin of my colleague Paul Crowley and the one I had sent in. This was a “Betts” model Stradivari “finished” in 2013 and build on the PG form. I started the violin when I was preparing to participate in my first Oberlin violin making workshop in 2011. I built the ribs after hours at Florian Leonhard’s workshop in Frognal lane, London. That year we were going to have the 1704 “Betts” Stradivari violin at the workshop in Oberlin to study and I mistakenly guessed that it had been made on Stradivari’s PG form, so that is the form I used to build this one. During the workshop Benjamin Ruth made a convincing argument that the 1704 violin was actually much more likely to have come off the P- form instead. During the workshop 2011 and 2012 I worked on this violin and there is not one square millimeter of the violin that has not been influenced by the precious advice of the many colleagues who worked with me and discussed its building with me during these inspiring weeks. Particularly the arching and the back of the peg-box were much more informed then if I had made the violin on my own at home. The violin is branded internally with the fire-marks Oberlin 2011 and Oberlin 2012. A further memory of the workshops is the plain, unflamed neck: in my usual fashion, I had planed to graft the neck to the volute but had forgotten to bring the material. When I asked around, Eugene Holtier kindly gave me a spare neck block. Yes, more then half of this 21st-century violin was made in the USA! In November 2011, after the birth of our daughter, we moved to Switzerland. I varnished the violin there, stripped it during a visit at Stephan’s place in Paris and re-varnished it once more after setting up my own workshop in London. By the time of it’s completion it had a similar travel history to some master student of violin performance… it had been forged in several of the hottest ovens of the early 21st century! I had made many violins in my positions in London and Switzerland, but this was the first I made and sold in my own name in many years. It went to the Italian student Elena Abbati, she was studying with Julia Schroeder at Freiburg at the time and went on to the conservatoire in Basel after that. The pound was strong back in 2014, I sold it for GBP 15000. Although my sterling price is a lot higher these days, my violins sold through dealers in the US and Switzerland have only gone up moderately. The bridge is the unique model developed by Mark Wilhelm in Switzerland. He made it about a year after I sold the violin, along with a new post and some fine adjustment to the fingerboard to help Elena out when the violin was not working at its best and London was too far to travel. After getting the violin back, I tried it with a couple of my more conventional bridges, but it simply works best with Mark’s. About a year ago, Elena brought the violin back because she had found a violin that suited her better. She finally released it in March and we agreed that I would resell it for her at my current price and keep a commission of 18%. I offered it to Mia Cooper, whose turn had come on my waiting list. She leads one of the national Irish orchestras and really liked it, but decided instead on a brand new violin of mine, because she liked the idea of it. While writing all of this, I realize what a truly unique violin this is: Its delivery has been helped by many trusted colleagues. Its sale facilitated the crucial first months of my new business but, ironically, it also is the first violin a client has returned to me because she found a violin that suited her better. This violin is also an excellent example that an instrument is never finished, although the sale of a violin marks the most distinct transition towards this category, it is only the beginning of a new chapter. No Easter egg hunt this year, with my family gone to Japan. Instead my brilliant assistant Gianmaria Stelzer and I split open and chopped up a Tyrolean roof and found some first quality tone wood big enough for about 30 perfectly cut violin tops. A dentrochronological analysis proved what an extraordinary find it was: these spruce trees grew in the same region and partly at the same time as those used by Antonio Stradivarius used for his instruments - much better then chocolate eggs or Easter bunnies! Last year, together with my colleague Gabor Draskoczy we traveled to northern Italy to take some samples of the old planks. Back in London, we planed them and send a picture in for the dentro. With the wood looking really fine, feeling good under the tools and this flattering dentro result, we bought the whole lot. The boards arrived on a pallet and were full of defects: knots, some woodworm, many cracks and of course, they were not cut to the quarter nor meticulously following the split. It needed a clear vision and systematical approach to get any usable violin fronts out of it. Some of these boards must have come from very big trees, their growth being super fine and showing only minimal curvature of the year rings in the end grain section. The fist violin with this special material is currently tanning in the UV-box. It was more then a decade ago, that I had to replace a worn out fingerboard on a beautiful Parisian violin made by Auguste Sébastien Phillipe Bernardel père. At the time, it was a special honour for me to work on that violin and my boss told me to choose a fine piece of ebony for it. I noticed that not one piece of our great stock had a similarly fine structure, all of our pieces showed bigger pores. I learned to accept that the super dense stuff is not available anymore. When I came across a particularly nice old board that had become too thin and narrow over decades of use, I restored it by adding height and width with strips of more ordinary pieces of ebony and stuck it on some of my own violins. Thanks to the black colour, resulting joints are generally invisible. 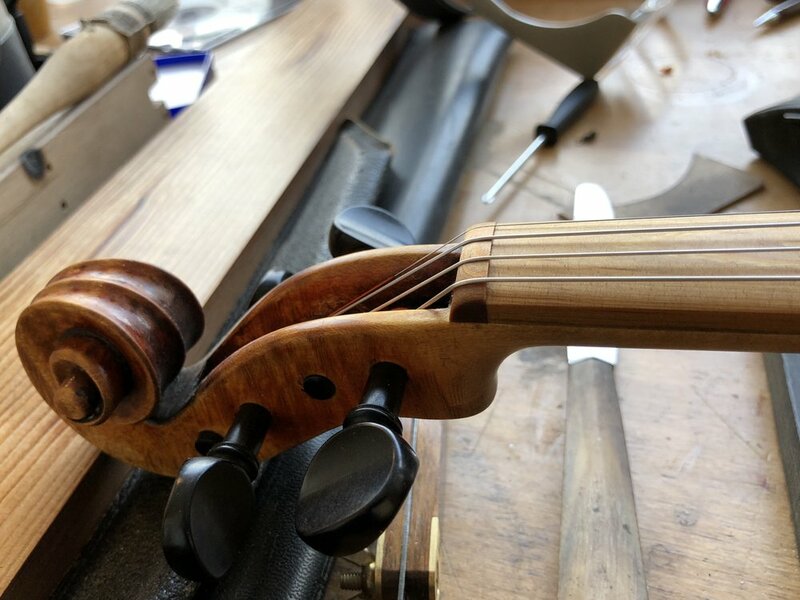 In 2011 the Swiss violin making association tion under the chair of Mark Wilhelm and John-Eric Traelness raised awareness in the trade with regards to the overexploitation of Ebony in Macassar. Now, in 2018 one replacement product is already on the marked and two more, equally developed in Switzerland, are in prototype stage and started to be tested on the first instruments last year. Corene is aready on the market. We did not test it, as it’s developer, John-Eric Traelness, could not make it to our conference. The two materials we did test and compare with ebony were the densified spruce and the composite fingerboard. Let me start with the spruce. A group of scientists from the ETH and EMPA in Zürich have managed to work out a recipe by which they can compress spruce to the same density range around 1.2 which is three times it’s natural density and similar to that of ebony. The surprising thing is that it is relatively stable, it can be planed beautifully and that it’s shavings feel healthy - the cuts to a clean, somewhat waxy finish. During the process it changes to a pleasing golden brown colour. They gave now formed a spin-off called Swiss Wood Solutions and have managed to secure a Horizon grant from the EU funding which will secure their funding for the next four years. The composite fingerboard developed by Andreas Hellinge is a completely different beast. He had been making fingerboards with a balsa carbon core and an ebony cover for nearly ten years and, together with the members of the Vienna Philharmonic Orchestra and J&A Beare in London has now come up with a new board featuring a special surface. It will be called the Hill fingerboard. The core is still made of balsa wood and it is reinforced by linen fibres on either side for stability. The sides are covered with blackened maple, as is the visible part of the underside. The surface layer is made up of many thin strips of wood glued together with polyurethane. The stripes run parallel to the strings and do embrace the string when it is pushed down by the player. Last week I played, listened and analysed my violin with both of these alternative fingerboards and the traditional ebony one and am really thrilled to say, that in my view , both improve the playability of this specific violin! It is early days, but I can not refrain from sharing my observations: Both fingerboards improved response and articulation. The composite fingerboard in particular helps the left hand and enables a gentler pressure - once the player reached the note, the finger can relax a tad more then normal. I get the feeling, that ebony is really not an ideal pair with the modern metal wound strings. It is as if playability benefits notably from a less slippery surface! In terms of sound, my violin gained in clarity with the composite fingerboard whereas it sounded rounder, more compact and balanced with the densified spruce. But, please, listen your self to the three excerpts played by Lisa Oberg and recorded at Wilhlem Geigenbau with a microphone set to one meter distance from the violin. If you do want to let me know your preference or that you are undecided, I am pleased to receive your vote via email! And the colour? I find the golden brown of the densified spruce beautiful, but will need to have it black in order to get non biased feed back. Only time will tell how these new materials will behave over the years in the busy hands of an active player.